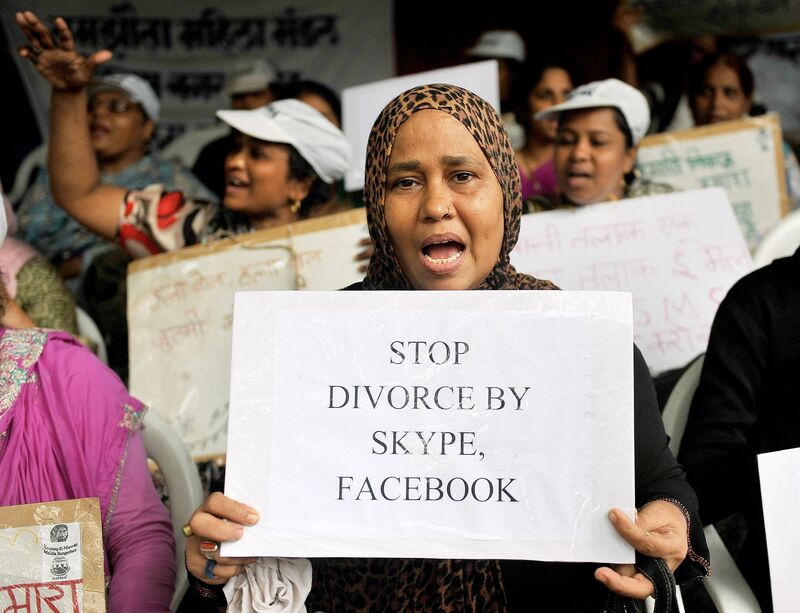 A step forward in gender justice is the Supreme Court’s admission of the petition of a Muslim woman, Shayara Bano, pleading that polygamy and oral triple talaq —saying talaq thrice in succession — violate fundamental human rights, and hence are unconstitutional. Indian politics has always sabotaged gender justice for Muslim women. But the Supreme Court does not have to woo Muslim vote banks, and can be objective. Sorry, but the Constitution makes it very clear that freedom of religion does not override fundamental rights, and does not bar reforms of traditional religious practices. Sharia law may permit the stoning to death of a woman for adultery, but our secular laws ban that. Sharia law may call for the amputation of fingers or hand of a thief, but not our secular laws. Sharia law may prohibit interest on loans, but Muslims giving or taking loans are subject to laws on interest payments. Now, religious minorities have been allowed to continue with traditional personal laws on matters like marriage and inheritance. Jawaharlal Nehru had the courage to amend Hindu personal law, outlawing polygamy and providing female rights to inherit property, divorce, and remarry. Alas, he funked similar reforms for Muslims, leaving Muslim women as oppressed and subjugated as ever. A Directive Principle of the Constitution says the state shall endeavour to secure for citizens a uniform civil code throughout India. This has never been implemented. Muslim conservatives are dead opposed. Religious objections apart, they say a civil code will become a form of Hindu oppression. Some enlightened Muslims have urged modernization of Islamic personal law. But secular political parties know that conservatives control the Muslim vote, and woo them by saying Muslims themselves must take the initiative on reforms. In effect, secular parties have thrown Muslim women to the wolves in search of votes. The BJP is the only party backing a common civil code, but its strong anti-Muslim instincts lead one to suspect it is keener on bashing Muslims than ending gender oppression. Women constitute half the Muslim population, but have no voice because of male subjugation. Politicians who say Muslims don’t want to reform personal laws are thinking only of male Muslims, not female Muslims. When oppressive Muslim laws keep women under the thumbs of men, they cannot express their true wants and have to follow male orders. Conservative Muslims have historically discouraged female education, keeping women disempowered and unable to strike out on their own. If a referendum with secret voting is held among Muslim women, they will surely opt to abolish triple talaq and polygamy. But they are not given the chance. So they remain disempowered and subjugated, with the shameful complicity of secular parties claiming to represent universal rights. The 2012 Committee on the Status of Women has made gender recommendations covering all religions. It seeks to ban triple talaq and polygamy. It seeks stronger provisions for maintenance payments to women and children (these can currently be cut off if a divorcee is “unchaste”). The Supreme Court should heed the report. Forget the propaganda that a common civil code will mean Hindu oppression. Goa is the only state that disallows personal laws of all religions. It has a uniform civil code — with a few exceptions not relevant to Muslims — based on Portuguese colonial laws. Goa’s mullahs sought to extend Muslim personal law to Goa after liberation from Portuguese rule, but happily were foiled by the Goa Muslim Women’s Associations and Muslim youth activists. Muslims account for 8.3% of Goa’s population, and are a prosperous community. The civil code has not oppressed Goan Muslims or forcibly Hinduised them. Any fear that a uniform civil code will mean Hindu oppression of Muslims will be exposed as groundless if India simply follows Goa’s example. The Supreme Court should point all political parties in Goa’s direction. Atleast Muslim woman politicians like Mehbooba Mufti, Najma Heptulla, should openly talk about abolishing anti-woman laws of Islam. Then only, it will get a voice and something positive might happe.